Conventional transportation practices typically focus on alleviating traffic congestion affecting motorists during peak travel periods. One of the underlying assumptions is that traffic congestion, particularly during these peak periods, is harmful to a region’s economy. This paper seeks to answer a seemingly straightforward question: is the fear of the negative economic effects of traffic congestion justified, or is congestion merely a nuisance with little economic impact? This research analyzed 30 years of data for 89 US metropolitan statistical areas (MSAs) to evaluate the economic impacts of traffic congestion at the regional level. 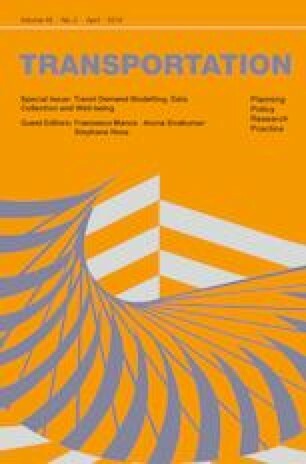 Employing a two-stage, least squares panel regression model, we controlled for endogeneity using instrumental variables and assessed the association between traffic congestion and per capita gross domestic product (GDP) as well as between traffic congestion and job growth for an 11-year time period. We then investigated the relationship between traffic congestion and per capita income for those same 11 years as well as for the thirty-year time period (1982–2011) when traffic congestion data were available. Controlling for the key variables found to be significant in the existing literature, our results suggest that the potential negative impact of traffic congestion on the economy does not deserve the attention it receives. Economic productivity is not significantly negatively impacted by high levels of traffic congestion. In fact, the results suggest a positive association between traffic congestion and per capita GDP as well as between traffic congestion and job growth at the MSA level. There was a statistically insignificant effect on per capita income. There may be valid reasons to continue the fight against congestion, but the idea that congestion will stifle the economy does not appear to be one of them. The authors would like to thank Ed Gaviria for his help during our initial discussions surrounding this topic as well as his preliminary data collection efforts. Although we ended up developing our own instrumental variables for this analysis, we appreciate Dr. Matthias Sweet of Ryerson University for generously sharing those used in his impressive papers. Lastly, we would like to thank the anonymous reviewers for their detailed and insightful recommendations. All authors that they have no conflict of interest. See Tables 7, 8, 9, 10, 11, 12 and 13.